The Ecologix Enhanced DAF is a complete primary (phys/chem) treatment system. 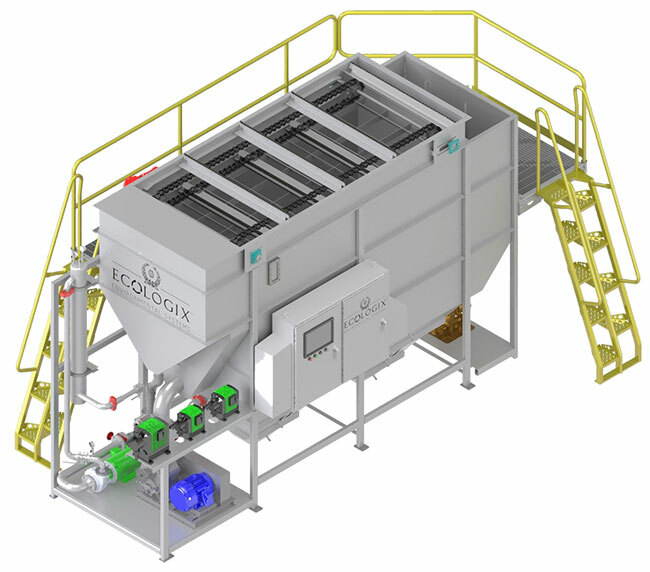 It is an incredibly versatile and efficient combined chemical precipitation and physical separation system. The E-DAF combines several proven technologies such as DAF (Dissolved Air Flotation), ACE (Air Charged Entrainment) and DGF (Dissolved Gas Flotation), into a single platform. Our E Series Dissolved Air Flotation (DAF) systems are the industry standard for efficient removal of Fats, Oils and Grease (FOG), Total Suspended Solids (TSS) and Biochemical Oxygen Demand (BOD) from a wide variety of wastewater streams. Dissolved air flotation (DAF) is a clarification process that utilizes air to remove suspended matter from the surface of treated water. DAF works by dissolving air under pressure and then releasing millions of tiny air bubbles into the water at atmospheric pressure. This process allows the dissolved air bubbles to adhere to a suspended matter within the water, causing it to come to the surface to be skimmed away. The process is also often assisted by the addition of a coagulant or a flocculant to the flow water, which encourages clustering of colloidal particles. Typically, DAF is used to clarify wastewater from food processing plants, oil refineries, oil fracking operation, chemical plants, and paper mills, among others. A strong DAF system is efficient and can clarify high volumes of wastewater in one session.. Reduced footprint – Compared to any comparable system with similar flow rate/loading levels. High efficiency – Utilizes inclined settling tubes for increased surface area and faster separation. Air scouring – for automatic tube cleaning. Whitewater pumps – robust pumps in combination with saturation tanks provide industry leading reliability and low maintenance whitewater (dissolved air). Countercurrent scraping – for the most efficient separation of sludge from the effluent water. This also allows for more free water to decant prior to sludge removal. Sludge grating/thickening – Prevents sludge migration and thickens it. Fewer moving parts – no need for bottom auger and motor. Why Chose Ecologix for DAF Systems? The Ecologix Enhanced DAF (E-DAF) System reduces the environmental footprint and impact when compared with other systems with similar flow rates and loading levels. For the environmentally conscious, this system will be the most efficient. The E-DAF also facilitates high-efficiency water treatment, meaning faster separation and larger quantities that can be treated on a smaller footprint. Battle sludge the right way. 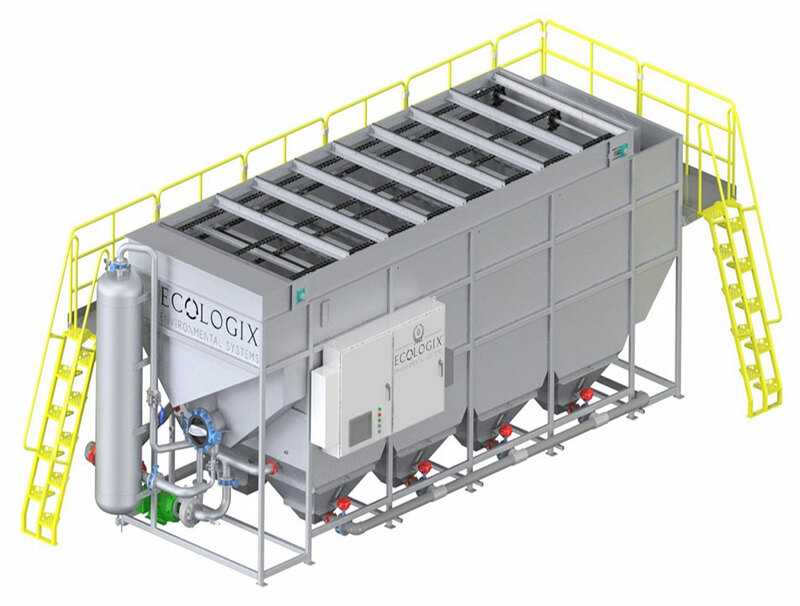 The system utilizes countercurrent scraping, the most efficient way to separate sludge from the effluent water, minimizing the chances of contamination to the effluent water. Sludge grating/thickening properties, also prevent sludge migration. DAF (Dissolved Air Flotation) and ACE (Air Charged Entrainment) combined into one – attached and entrained air for higher separation efficiencies. Upgradable to a full ITS (Integrated Treatment System) – including upgraded control panel, chemical feed pumps, polymer make down system, flocculation tubes, pre-wired and pretested as a complete wastewater treatment system. Easily converted to DGF (Dissolved Gas Flotation) for refineries and offshore platforms. Integrated walking mezzanine with stairs. Our innovative DAF system has the option to include an enhanced floctube assembly to increase contact time and improve dramatically system performance. Currently available configurations are listed below. The following is a sampling of applications that we have successfully deployed DAF systems. Learn more about our E-DAF models, flowrates, and design specs.